An increase in the price of goods and services, leaves less of purchasing power in the hands of common man. It can be calculated on percentage basis, easily on 100. For example – if the inflation rate is 3 percent then on every Rs.100 commodity will be sold for Rs.103. When calculating inflation several things come into consideration like Gross Domestic Product deflator, Producer Prices, Export Prices, Import Prices etc. but the percentage change in consumer price index over time is the chief measuring criteria of calculating inflation. It should not be on the extremes but having 4-5 percent of inflation is considered to be optimum amount of it. Inflation control is in hands of Reserve Bank of India, the Central Bank of India. Its job is to control inflation as well as deflation so that prices of goods and services do not shoot and reaches sky. As we all know every cause has an effect and thus, here the effect is in the form of reduction in the purchasing power per unit of money. Also, it has both positive and negative effects. Negative effect is that it may discourage investment and savings but positive thing is that it may encourage investment in non-monetary capital projects. The main reason behind inflation is excessive supply of money. 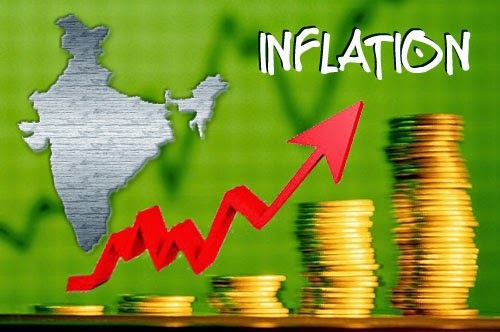 As per the data disclosed by the Ministry of Statistics and Program Implementation, India for the month of July 2014, inflation rate in India is currently at 7.96 percent from 7.31 percent in the previous month driven by higher food prices. Looking at the average of inflation from the year 2012 till 2014, it was 9.49 percent. It crossed the limit when it reached its all-time high of 11.16 percent in November 2013. The Governor of Reserve Bank of India announced that consumer price index is a better instrument than wholesale price index for measuring inflation. Indian economy has food, beverages and tobacco as the most significant items in the consumer price index that counts to almost 49.7 percent of consumer price index. Recently it has been recorded that food and beverage prices surge by 9.16 percent in July 2014 from 7.9 percent in June 2014. There is a distinction between rural and urban inflation. The consumer price index increased by 8.45 percent and 7.42 percent in rural and urban areas respectively. As mentioned above the main reason for the arising of problem is excessive supply of money or excessive aggregate demand. Demand pull inflation is one of the reasons. It means that economic growth is above the long run trend rate of growth and further which means average sustainable growth which is determined by the growth in productivity. For example if the government cut interest rates and also cut taxes, house prices will rise fuelling a positive price effect and a rise in consumer confidence i.e. more purchasing power and this leads to excessive spending, lower saving and an increase in borrowing. This will result in the problem of inflation. Another reason is cost push inflation. This includes rising wages which are cost for firms, import prices that will become more expensive leading to an increase in inflation, raw material prices and the best example is oil as increase in the price of oil leads to a significant increase in the prices of most of the goods in the economy. Another reason is profit push inflation, most likely to occur during strong economic growth. Also, if firms become less productive and allow costs to rise, this invariably leads to higher prices. If Government put up taxes, such as value added tax this will lead to higher prices and thus, inflation. Printing more money could also lead to inflation. There are many solutions to control the inflation. India's inflation is largely consumption driven. The Reserve Bank of India raises the interest rates to keep inflation under control. But relation of consumption is not only connected with economic growth but also with public subsidies. Thus, the two major measures to control inflation are monetary measures as well as fiscal measures. Recent measures by Modi Government imposed restrictions on exports and checked hoarding to control food prices only because of the reason that hike in the prices of vegetables especially potatoes and onions contributed to sell off in financial markets. New measures include releasing five million tonnes of rice from state stockpiles to curb inflation. Credit control is another measure. To implement this it should increase the bank rate and minimum cash reserve ratio. It should also issue notice to other banks to control credit as issued in public interest. Public expenditure should be decreased. Old debts should be paid. Taxes should be increased and imports should be increased while exports should be decreased. Production of those goods should be increased whose prices rise rapidly and for this matter public sector should be expanded and private sector should be given more incentives. Last but not the least, Attractive saving schemes should be rolled out during the time of inflation.